A few nights ago we had a fun family night. It was our first since we officially became “empty nesters”. It was wonderful having the kids over for dinner and some fun games. I am so grateful that although the kids are not living at home anymore, they are still on the island and we still have opportunities to gather together for fun, food and fellowship. While we were together we celebrated a job promotion that Kalani had just received. In fact the very next day he was scheduled to begin his new position at work. Kalani is a CPA. 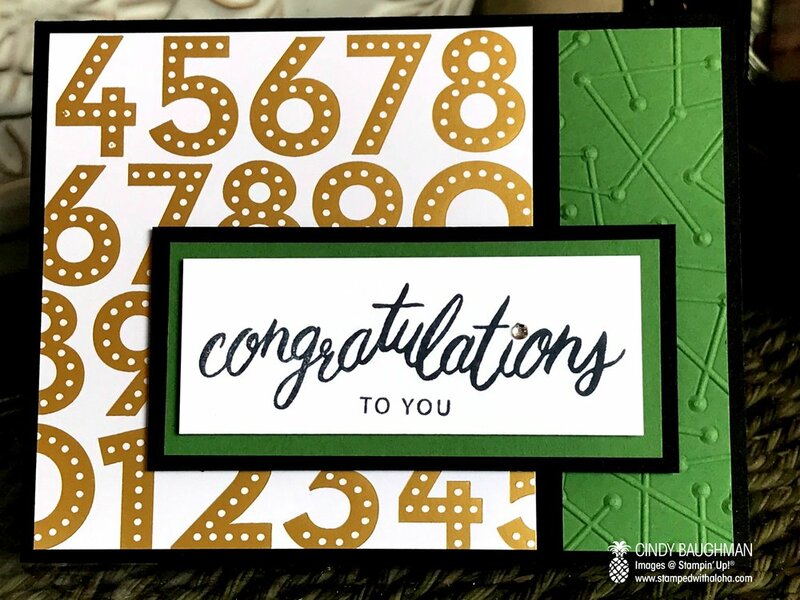 So since he works with numbers, I thought it would be best to create his card with the fancy “numbers” sheet from our Broadway Bound Specialty Designer Series Paper! I﻿t’s hard to tell in the photo but the numbers are really bright and shiny. I added some texture to the card using one of our newer Textured Impressions Embossing Folders that is called, Maps, etc. The sentiment on this card comes from a beautiful stamp set called Friendly Expressions! It’s been hard with out the kids being around as much. The house is so quiet. So when we get together it makes me so happy. I am glad that we were able to gather to not only enjoy family time together but also to say congratulations to Kalani. Congratulations Kalani, we are very proud of you!